Manuel Antonio Domínguez, whose project is firmly committed in observing how the male image is constructed, reflects on “la relación estable” on the structural classification of society, organized around gender roles and their Established models. 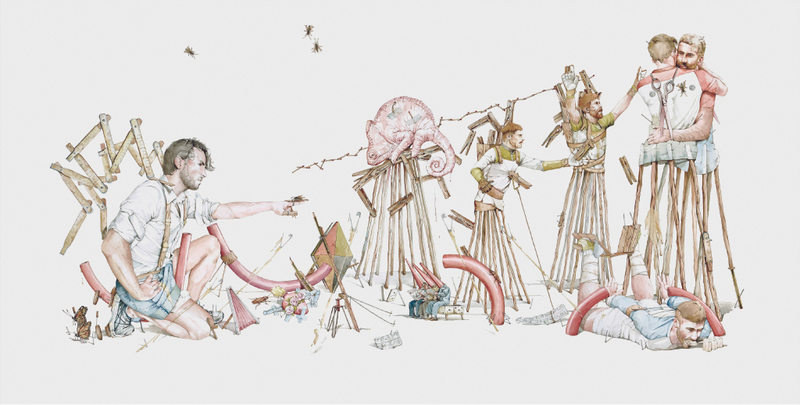 With this 16-metre-long drawing, his most ambitious work both formal and conceptual, leaves the spectator’s ability to interpret the scenes, with creations that do not have a definitive meaning beyond a subjective look. The artist, whose meticulous technique deals with a figurative and narrative world, presents to us in this frieze his personal, intimate and everyday universe full of details that make the contemplation of his pieces. “la relación estable” direct reference to those Assumptions that are assumed by default and are not discussed, assuming that any appearance is a faithful representation of deeper and more complex intangible aspects. Ideas and beliefs assumed, whose foundations, as opposed to the title, are staggered to the gaze of Manuel Antonio Domínguez and the spectator himself. In this way, in his work the dogmas are volatilized and the individual or social certainties jump through the air.